. 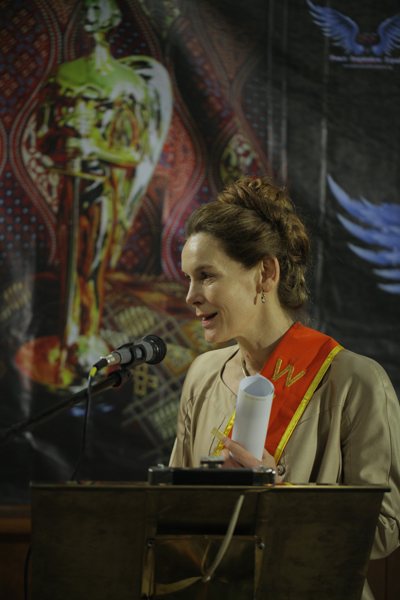 Alice Krige during her visit to Indonesia gives an Acting Master Class in International Film Festival for Peace, Inspiration and Equality (FFPIE). “Acting is not faking it is being” she said with a meaningful voice. Alice Krige is known for her role as Borg Queen in the movie Star Trek: First Contact where she was awarded with Saturn Award as Best Supporting Actress. She has been starring in movies like; The Sorcerer’s Apprentice, Silent Hill, King David, 7 academy-award nomination; Chariots of Fire and Thor: The Dark World, etc. Alice Krige also received Special Jury Award for her movie Shigetsu in Feature Film category. Shingetsu tells a story about the principle of Yin and Yang and also the harmony of nature. This film is directed by Paul Schoolman. Damien Dematra, as the founder and director of IFFPIE feels very happy by the coming of Alice in Indonesia. He hopes that Alice will bring more celebrities from all over the world to come to Indonesia and promoting the country internationally. Damien also hope there will be more actors and actresses from Hollywood who would like to play in a movie with an inspiring genre like Shingetsu.